If you hired talented employees, your next goal is to provide them with as much development possibilities as possible. You will need to suggest training programs that complies with your strategic goals. To take a control over training and development process you will need to focus on key training performance metrics, such as the number of training hours per employee per year across the business, time gap between when a training need is identified and when it is accomplished, the assessment of the improved performance - increased sales, quality, productivity, decrease in defects etc. Training and Development Balanced Scorecard Metrics will help you to accomplish this performance measurement task. The best way to improve HR performance is to train managers. 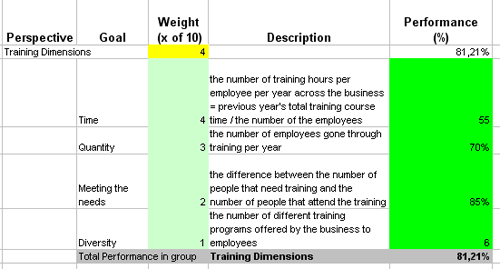 HR training metrics evaluates efficiency of educational campaigns for HR. KPIs in this category include training costs per employee, efficiency of training sessions, number of training sessions per employee. Continuous evaluation of these KPIs and the HR Balanced Scorecard will help optimize training costs and improve efficiency of education campaigns. Download trial version of Development Metrics. Purchase full version of Development Metrics + bonus. HR training is concerned with providing the employees training sessions to hone their HR skills. This promotes better inter-personal skills among and between taskforces. Also, it helps in keeping up the motivation and morale levels high. Doing this is extremely important to create an involved workforce that would not hesitate 'going out of its way' whenever required. Also, people are often asked to work in teams and groups. This asks for good enough communication skills together with the talent of successful leadership of the team members. Heading on, to pull all these aspects together, one needs an efficient methodology that can provide an overview of how the processes have been going. People often use Balanced Scorecard for this purpose as it can be used to put the measurable phrases called 'metrics/ indicators' at one place. Moreover, these can be reviewed in future at any instant of time to keep a check on the values and numbers. This is to make sure that magnitudes are within the tolerable range and intervals. Stating it in a nut-shell, scorecards are a way to win over the subjectivity and qualitative nature of several organizational aspects. This utility feature has made it a useful managerial tool. Related metrics and KPIs for: HR, HR Hire, Leadership, Motivation, HR accounting, HR Outsourcing, Awards, Retirement, Training Pack. Customers who viewed this item also viewed: Personal Scorecards Pack with Time Management and Communications Scorecards | Knowledge Management Metrics Pack | Education Scorecards Pack. This is the actual scorecard with Development Metrics and performance indicators. The performance indicators include: Learning Progress, Behavior Progress, Business Progress, Fulfillment of social contract. Download a trial version of Training and Development Balanced Scorecard or purchase a full version online.